Applying hydrogen peroxide is a fast and effective way to boost oxygen levels in water bodies in an environmental emergency situation. It can provide rapid relief for aquatic life where pollutants or natural events cause acute reductions in dissolved oxygen levels. This can help to prevent mortalities of fish and damage to other aquatic life, while assisting the natural recovery of the ecosystem. Hydrogen peroxide is also useful in controlling algal and bacterial growth to improve water quality for open water swimming and immersion sports. We are also able to provide conventional aeration systems to alleviate the effects of environmental incidents or natural events. OHES staff have extensive experience in the management, supervision and monitoring of hydrogen peroxide application operations at high profile sites in emergency and planned response situations. Our knowledge and expertise in water chemistry, aquatic ecology and fisheries science ensures that each operation is conducted safely and that the environment is protected. We provide a safe and effective aeration and hydrogen peroxide application service throughout the UK with rapid response times. As part of the preparations for the London 2012 Olympic Games, a trial event for the Olympic Triathlon was held at The Serpentine in Hyde Park, Central London in the summer of 2011. Working on behalf of the Royal Parks, OHES managed and supervised the dosing of over 15,000 litres of hydrogen peroxide into The Serpentine, with the objective of controlling the growth of algae and improving dissolved oxygen levels in the waterbody ahead of the event. The exercise was carefully scoped by OHES staff prior to the operation and compliance monitoring took place before, during and after dosing to ensure that environmental limits set by the Environment Agency were not exceeded. The operation was a success and oxygen levels were increased significantly ahead of the event; while algal growth was restricted. Water Quality Contingency Planning and 24-7 standby for the London 2012 Olympic Games open water swimming events and environmental incidents. Following the success of our work ahead of the Olympic Triathlon Trial event in 2011, OHES were again involved in developing a water quality contingency plan on behalf of The Royal Parks. 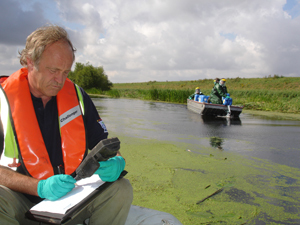 This involved a careful assessment of existing water quality monitoring data leading up to the London 2012 Olympic and Paralympic Games, and the development of a response plan to manage any environmental incidents ahead of, or during the Games, with particular emphasis on the treatment of the waterbody with hydrogen peroxide and associated water quality monitoring. Additionally, OHES staff were on 24-7 standby throughout the London 2012 Olympic and Paralympic Games to respond to any environmental incidents during this seven week period.